Today, we're happy to share some updates on code.google.com/speed with you. 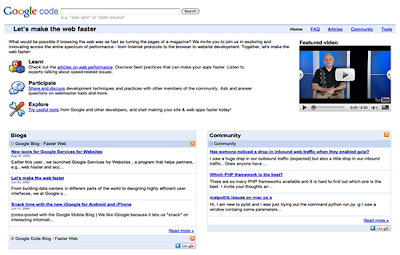 A blog gadget that aggregates performance related posts from Google blogs. We improved the layout to make navigation between different tutorials, tech talks and tools smoother. Just as making the web faster is an ongoing process, we plan to continue updating and enhancing code.google.com/speed with more resources. Currently, we are focusing on increasing community involvement, such as adding more tutorials and tech talks from non-Google authors. So, as a first step, if you have recently written an interesting article on web performance, please let us know by filling in this form. Our team will evaluate all entries and may contact you for potential next steps. Together, let's make the web faster! Welcome to www.homebasedonlinetravelagent.in a division of dewanholidays.com … your gateway to success in the travel industry. Whether you’re an experienced travel agent, an agency or new to the industry, we hope you’ll find our programs superior in scope and the easiest way to ADD MORE TO YOUR INCOME ! !